Kim Duff, master craftsman in the art of traditional blacksmithing and now creator of some of the finest steel, ornamental sculptures and furnishings, integrates the practicality of steel, timber, sandstone, glass and marble. 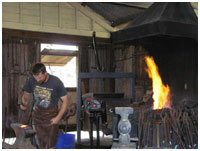 Since completing his Boilermaker Apprenticeship in 1990, Kim has spent his time learning the art of traditional Blacksmithing from his grandfather, until he embarked on establishing his business IRONIC ART. Kim's aim is to specialize in the creation of unique pieces of art work that employ both honoured and modern methods of construction. Over the past 16 years he has gained an enviable reputation for his workmanship and quality of service. Ironic Art's aim is to design and construct a unique and unusual piece of art using various grades of steel. All Ironic Art's artwork has been designed for individual clients who were seeking something both unique and visually appealing. Each project involves consulting with the client to gain an understanding of their vision for the project, the design stage to meet with the client's approval. The subsequent construction of the project employing a variety of techniques, materials and finished to achieve a result that meets the client’s expectations. Ironic Art has the necessary infrastructure to handle both repetitive design features and complex one of a kind designs in both timely and cost effective manner. "I warmly welcome you to come and visit us at my workshop situated at Duff’s Complex, 74 Western Drive, Gatton."